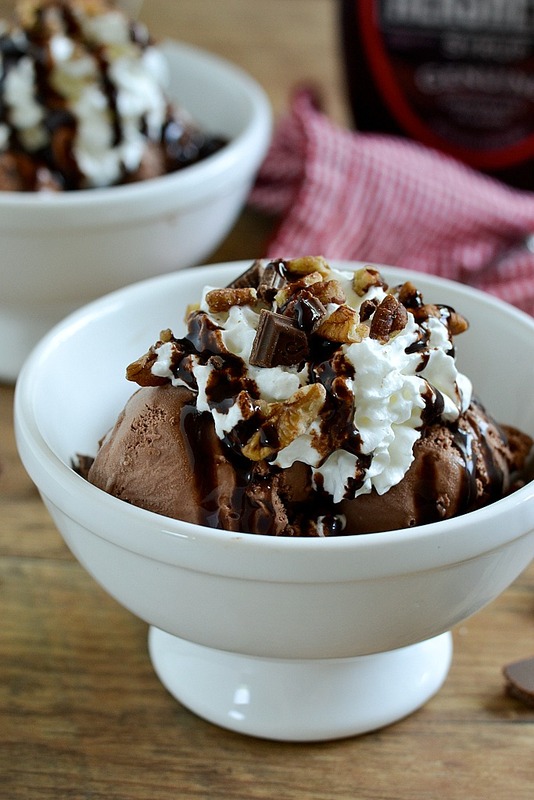 An easy recipe for Mississippi Mud Pie Sundaes with crushed chocolate graham crackers, scoops of chocolate ice cream and topped with whipped cream, pecans and Hershey’s Chocolate Syrup. I remember when I was a kid and I learned how to spell Mississippi. Every time I write it I still say it the same way in my head as I learned it years ago. M-I-S-S-I-S-S-I-P-P-I. It makes me laugh a little because lately my kids have me spell EVERYTHING. If you can spell it, they ask. It’s really cute. Now I’m waiting for them to ask me how to spell Mississippi. When they ask, I’m going to say S-U-N-D-A-E.
Every chocolate and ice cream lover needs to make this Mississippi Mud Pie Sundae. If you love Mississippi Mud Pie you are in for a real treat. 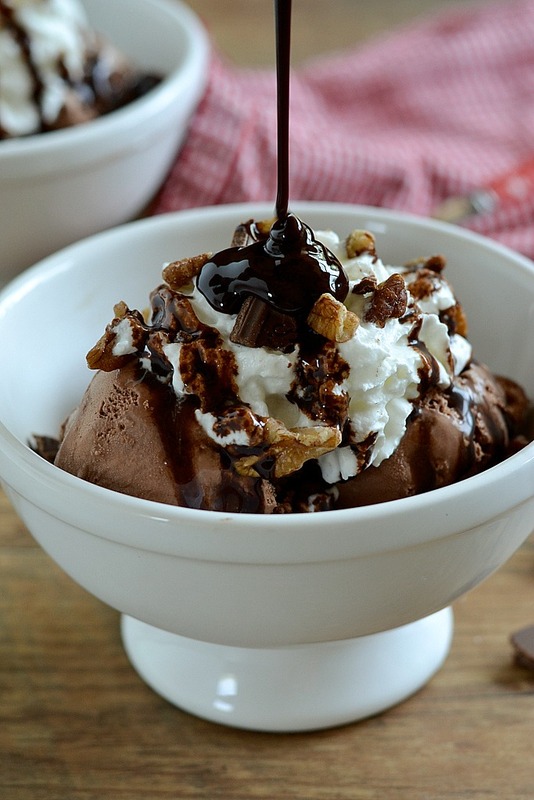 It’s starts with a layer of crushed chocolate graham crackers, topped with rich chocolately ice cream and topped with big dollop of whipped cream, pecans and Hershey’s Chocolate Syrup. It’s everything you love about Mississippi Mud Pie all in a sundae just waiting for you to dive into with a spoon. 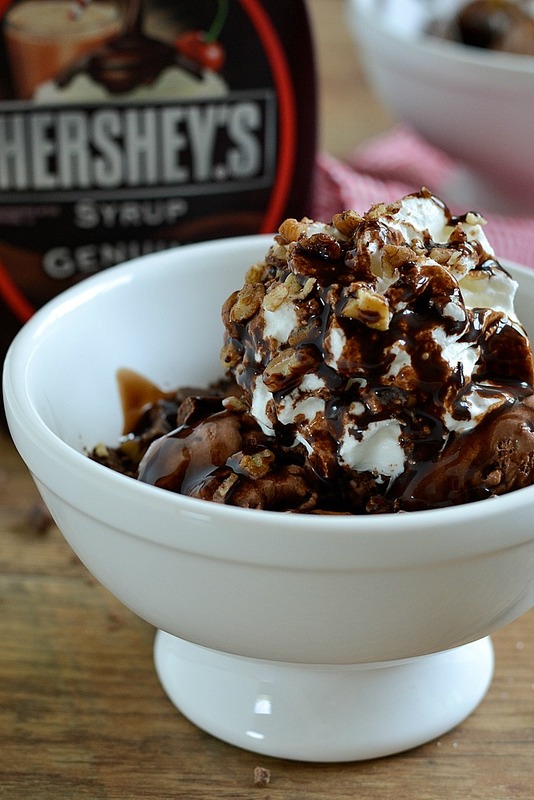 Rich and smooth Hershey’s Syrup is delicious on ice cream or frozen yogurt treats, mixed in milk or used in recipes. Hershey’s Syrup is available in a variety of flavors including chocolate, special dark chocolate, strawberry and caramel. My kids love chocolate milk and strawberry milk, or as they call it “pink milk”and it is always made with Hershey’s Syrup. We love to BBQ on the weekends. Whether we are heading to our camp or spending it in our backyard in our pool it’s all about quality time together and enjoy meals as a family. For dessert my kids love to make sundaes or I’ll make a sundae bar for everyone to make their own. Sundae bars are always a fun addition to any backyard BBQ. You can have a theme sundae bar or just put on a variety of toppings like sprinkles, nuts and a variety of Hershey’s Syrup and everyone make their own delicious sundae. I also like to make scoops of ice cream ahead of time and place them in the freezer on a baking sheet or pre-scoop them ahead of time into fun little ice cream cups that I find at any craft store. Right before everyone is ready to make their sundaes I’ll get the ice cream scoops out of the freezer and place them on the sundae bar. 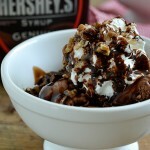 Not only is creating a sundae bar an easy, no stress dessert to serve but it is always a hit! Not only are sundaes easy, everyone loves them. They are also perfect for hot summer days. Celebrate #SundaeSundays with your family and have everyone create their own delicious sundaes. Gather your favorite toppings including Hershey’s Syrups and make a sundae bar or put all the ingredients out for everyone to make this Mississippi Mud Pie Sundae. It is so G-O-O-D! 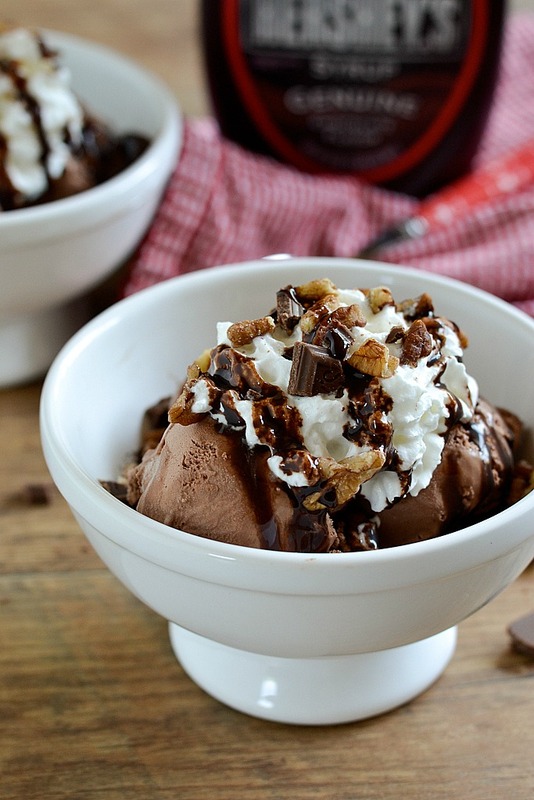 An easy recipe for Mississippi Mud Pie Sundaes with crushed chocolate graham crackers, scoops of chocolate ice cream and topped with whipped cream, pecans and Hershey's chocolate syrup. Divide crushed graham crackers (about 1/4 cup each) and place in the bottom of desired ice cream serving glasses. Add ice cream on top of crushed graham crackers, about 3 1/4 cup scoops each, about 3/4 cup of ice cream per serving depending on size of serving glass. 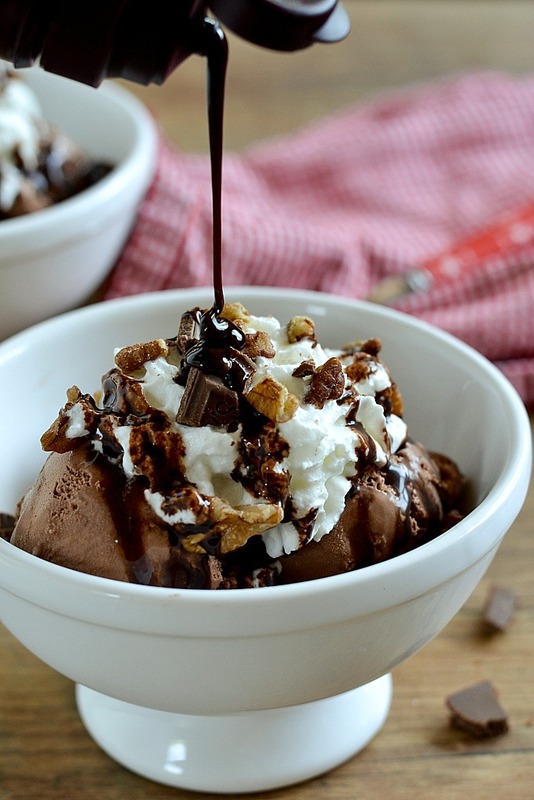 Top with a dollop of whipped cream, chocolate syrup, pecans and chopped chocolate. Compensation was provided by The Hershey Company via MomTrends. The opinions expressed herein are those of the author and are not indicative of the opinions of The Hershey Company or Momtrends.